Wireframe tools can be a boon to project managers who like to showcase their work before it even started. Showcasing a coded website or developed mobile app to your clients is literally not possible. A wireframing tool can help you design a mockup website theme in a matter of minutes with drag and drog of website elements to the application workspace. You even have control over the final export with exporting to pdf , png or sharing online is easily possible as well. Online wireframe applications has become more powerful with great user interface allowing us to create a blueprint in no time. The features set doesn’t end there either as you can even find bootstrap libraries, basic shapes, website elements etc on almost all apps here. 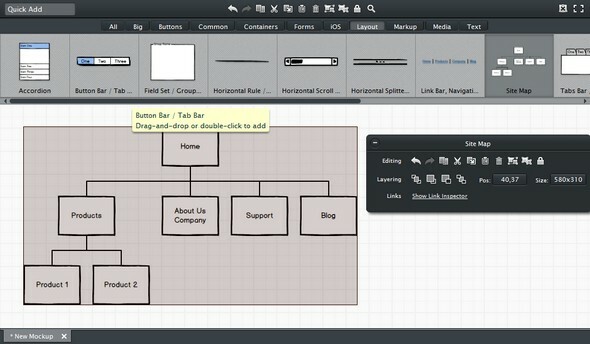 Stay tuned for more wireframe tools designed for online working which we will introduce here soon. Showcasing a design in low fidelity wireframes to unique high fidelity prototypes is essential for impressing clients in any firm. 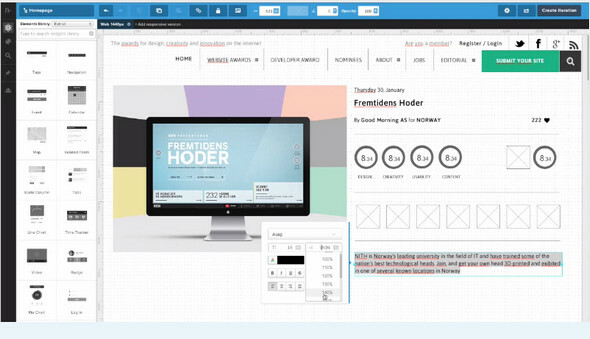 With the power of modern day free online wireframe tools you can create prototypes utilizing the big set of web element libraries and clean user interface these online apps offer. Some online applications allow only a free trial recently but it is worth choosing them if you find them very useful. Executing a design before live coding means having a clear picture of what we are aiming for at the end of that particular project. These tools are just designed to accomplish this thing so that we can focus on a specific task at hand. While adjustments are always required even for a well planned project you have complete control of your saved project so editing anytime is possible. Visual presentation of website pages will interest your employer or your clients. 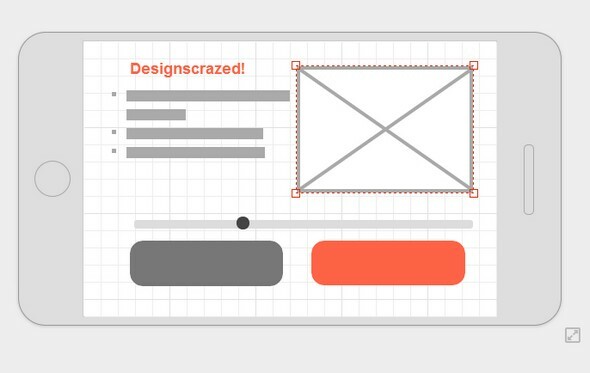 So take your time to check out these amazing wireframe tools. Lovely Charts is easy to use free online wireframing tool which can be accessed with free registration. The projects are saved online only but you can export the whole chart on to a png or jpg file to show the final wireframe design to your clients. This tool is built to create prototypes fast and nothing else. The library for wireframe may be very less when compared to other apps but you can utilize other library elements in the application which is available in symbols, flowcharts etc. Import icons, your own symbols, images etc to this web app via import symbols option and i think its pretty cool to have this feature. One of the other feature is the tools option in the sidebar where you can choose two options one is to drag and drop elements, move objects around the chart and the other is to draw a connect line to the designed wireframe elements. Everything you need for a standard online and free wireframing application is integrated into lovely charts app. Try it today. A completely free tool for personal use with all mockup features you can get your hands on. You must subscribe to the application if you are doing commercial projects and its worth every penny. Project template can be chosen regarding the type of mockup you are trying to build. Everything from mobile app design to website design is possible with this online web application. Beautiful hand drawn sketches of website elements can be found here as well. Sharing a link of the mockup or exporting to PDF and PNG from the project list page can be done easily. Once your wireframe design is complete you can prototype the whole thing as required in a suitable mobile device which i think will surely impress you. Register for free to start using this web application for creating cool mockups in any browser and share with anyone. Export to jpg, png and svg in seconds and create professional-quality flowcharts, Org charts, UML diagrams, Network diagrams, Wireframes, Technical drawings and more. A 14 day free trail exist on this app which is a surprise. Either ways i found this tool very useful with large set of libraries for modern website design as well. Lets you Drag and drop the elements, use keyboard shortcuts like cut, copy, paste etc to speed up the work. Too awesome web application which only has 30 day free trail but you will start using it since it has the best features for any wire framing tool available online today. Finalize the work at the end of the day with a high fidelity solid prototyping features on this web app. The elements library has a huge set of ui elements to play around with. Starting with bootstrap widgets, flat ui kit, semantic ui, iPhone ui, Google glass ui etc there are even more libraries included with this online wireframe tool which looks like never ending saga. Mockflow is a simple website wireframe tool which lets you create blueprints, mockups of websites like drupal, WordPress, mockup app wireframe, software GUI in a matter of minutes. Adding a new project in mockflow wireframe tool is pretty easy as you can choose between web, mobile and theme based options. 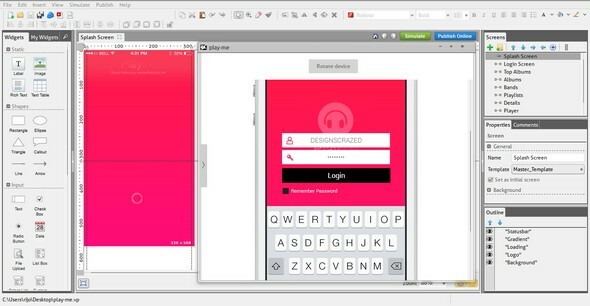 Showcase your everyday mobile app wireframe projects now easily with mockflow. Exporting the completed projects can be done in multiple formats starting with pdf, html, powerpoint, high quality png files etc. This tool has the largest library of mock-up which can be useful for blueprint of your next project in style. Free version allows one project to be saved and edited. 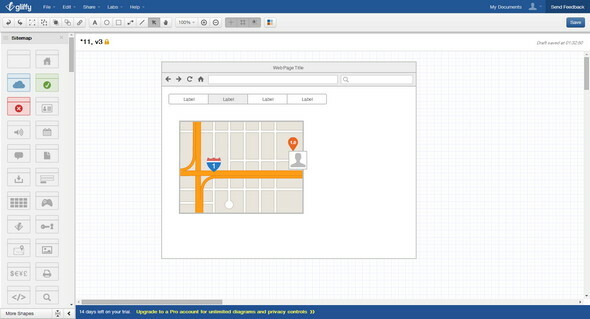 Balsamiq wireframe tool is available for download to all operating systems. It also provides a web mockup application for online wireframe project creation provided by Balsamic team. A trial version is available for 7 days to test this software by yourself. This tool is much more focused on website mockup with good features ranging from charts to accordion tabs and much more. Export file as PDF, PNG or clipboard element. This online application allows a free plan with 1 project and 10 pages. A website wireframe tool essential for creating mock-ups for website with all web elements in one place. Share your mocks with your friends and export them to psd or png files as you like. This wireframe tool is build for super fast mockup creation online. Start creating your simple projects with this online tool for desktop browser, mobiles, tablet with pre defined templates. The final output is also saved online and you will end up with a link of your project which you can share with your colleagues. This is a mobile app wireframe tool that is designed to help manage projects for developers, designers or project managers. It can be downloaded for desktop as this software is available for all operating system and for a trial period of 14 days. 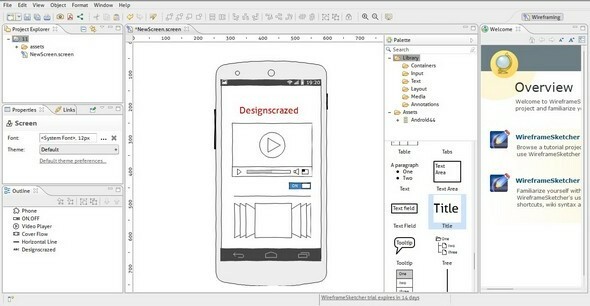 Supports Android, ios, windows and even web wireframe templates to be created very easily. 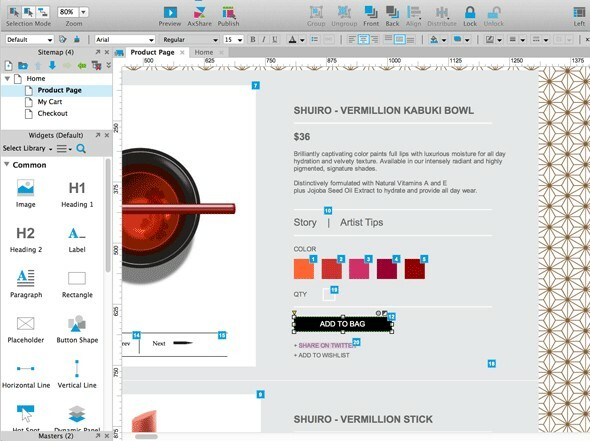 Drag and drop web elements to the workspace to create your own custom mock-up design. Exporting templates is possible in multiple formats like pdf, images or even online sharing has been made much easier with these software. 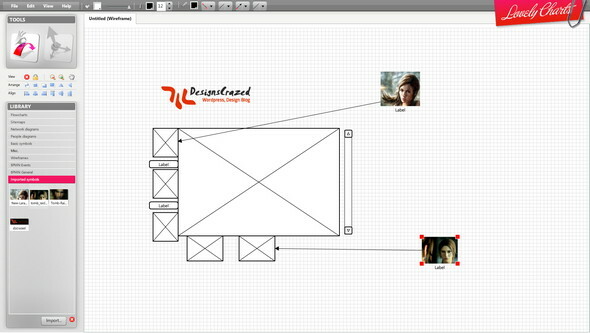 So far my favorite wireframing tool as creating complex sketches is possible with ease in this application. Download free stencils provided by the creator which allows even more elements to play around with mobile apps. As it claims this wireframe prototyper is rich in features and provides a completely free lite edition for project management. Create unlimited projects, pages and this offline tool provides interactive widget selection for android, ios and ipad apps along with web apps. Export to PDF and images with options for online storage of 10MB. Emulate mobile devices depending on your prototype requirements. Software is supported for all windows and mac OS. Impressive stimulation of mobile – ipad applications, online store for websites and much more is possible making this tool a heavy arsenal for wireframe prototype users. Definitely a must have as it is free. 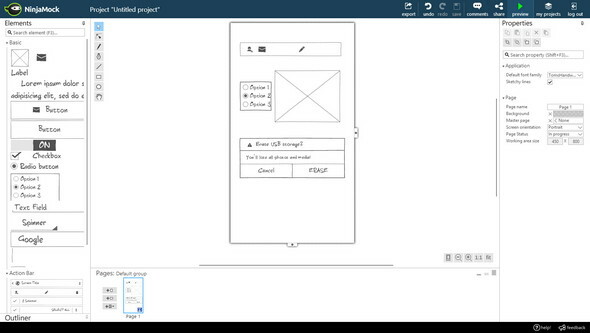 Wireframing, prototyping options to create your designs before making live code is possible with Axure. With wireframe support for mobiles, websites, tablets this tool can be perfect for project management of your latest projects. The tutorials for Axure are very precise and you will be able to master the whole tool in no time. 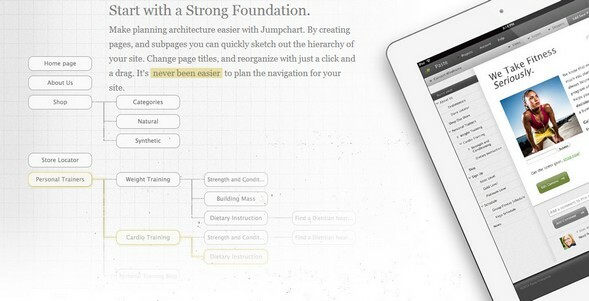 Manage Design, content, notes or any resources project with ease with jumpchart online tool. A minmail wireframe tool with little features which might catch your interest. The project is saved online and a link is provided to view the project next time. Let us know if you have used any of these and recommend any other great free wireframe tools for our subscribers. hey, am not a techie person and just want to create a wireframe for an app i have in mind. which might be the simplest to self learn and work with please? 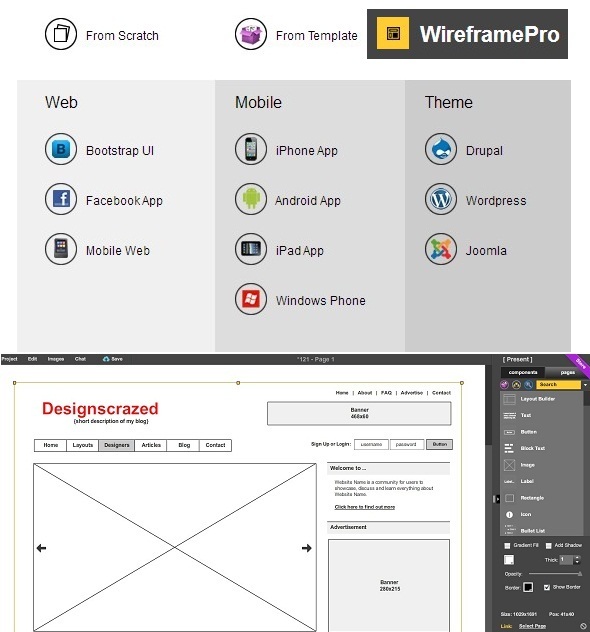 It has a custome wireframe library and blockframe library which makes the wireframing process very simple and quick. You can also make the wireframe clickable if you want. be great to hear what you think of it.